What a great capture... love the light! Love the light you captured here, Kerri! Very well done! Good capture but I am not happy with them today. They crawled all over my foot and were biting me when I was trying to take pictures of the moths..lol. I am glad I carry afterbite with me. Love the Lighting and How you Captured him in the light! FAV Kerri,,Well done! Maybe it's an invasion because they are everywhere here also. Great lighting. Reminds me of Frye's Electronic Store. They have giant ants all over the place from the old BW Classic "They"
Great capture, love the lighting. love the lighting and focus! yes everywhere but this is nice one.....shot!!!!!!!!!!!!! Great capture! Love the "spotlight" highlighting the ant. Lovely shot, i love the contrast between light and shadow, great work! Oooh, it's cute! And I love the pool of light around it! Awesome capture, Kerri! These things are so fast! Beautiful light and great focusing. 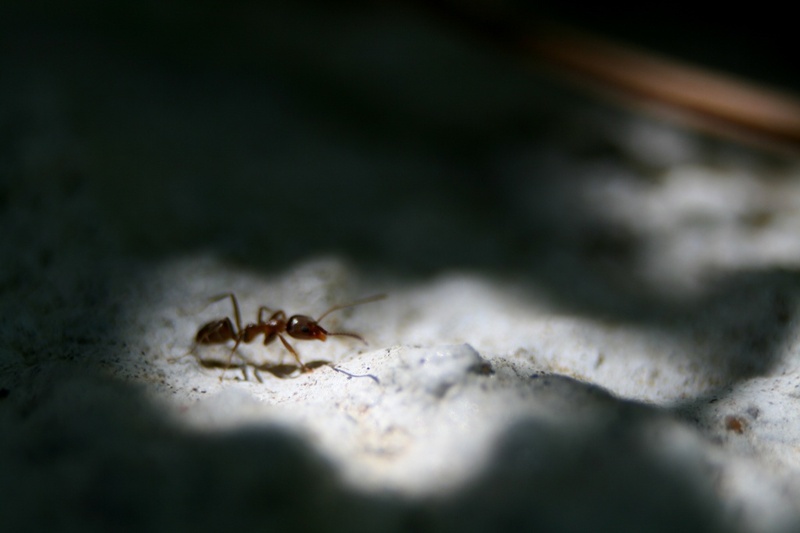 Do ants rule the world? They sure are! Great processing! It's that time of the year. Great macro! And you put the sinner firmly in the spotlight. Cool lighting and shadows providing the perfect eerie look! Thats cool. Nice work burning in there Like that. She's enjoying her moment in the light! terrific shot! i like the lighting around this guy. just like he's in the spot light! Great POV and lighting. I do NOT like ants because they get into everything. A fav. Nice theme pic! They ARE monsters!!! Wow! Excellent close-up and focus! Love the lighting in this. Good shot! The lighting in this pic. is perfect..not too happy t see so many of these huge anst about but they do make a great subject.. Excellent capturing the ant in the light & great focus also! Cool lighting!!! They are so pesky! !